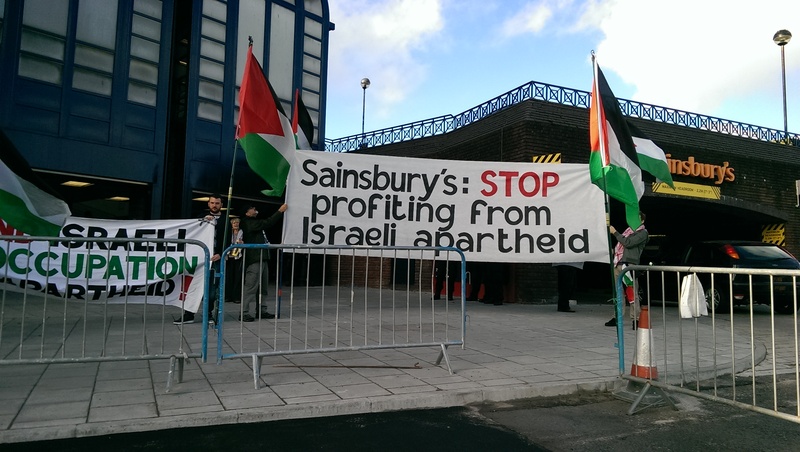 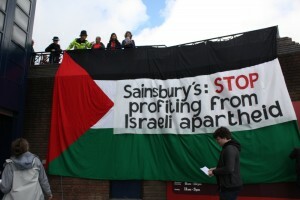 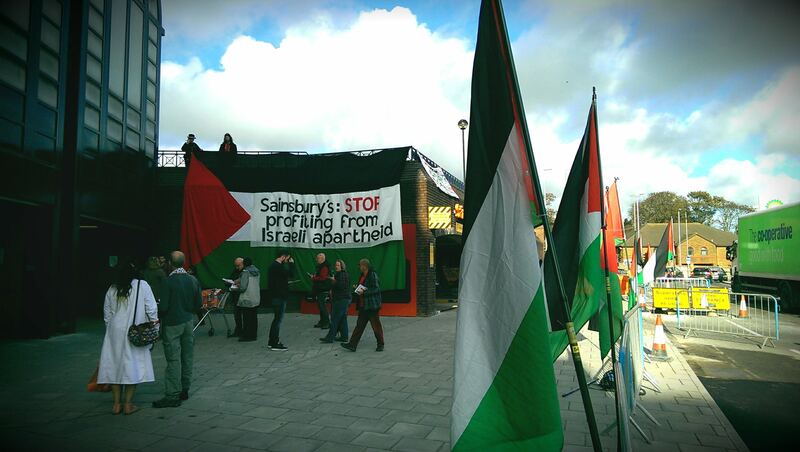 Once each month BHPSC contributes to the national campaign to urge Sainsbury’s to put its ethical trading policy into practice, and stop doing business with companies complicit in the illegal occupation of Palestine. 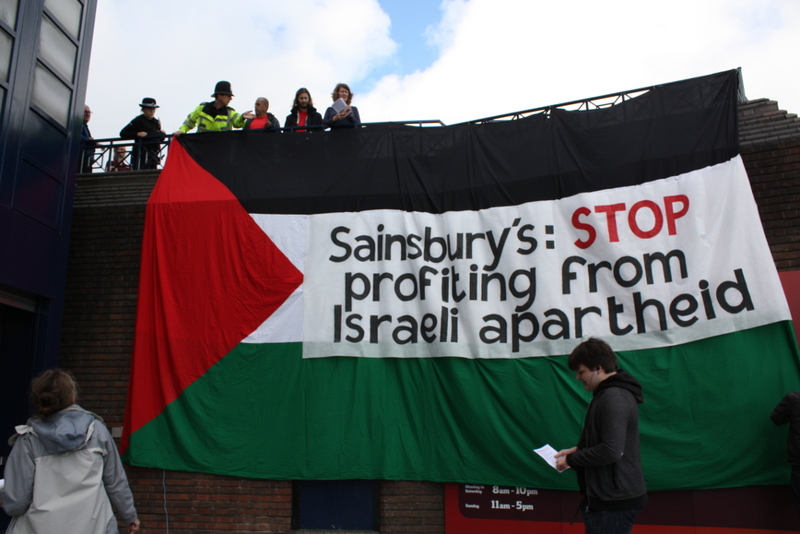 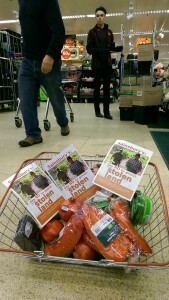 After two years of corporate intransigence on the company’s part, we wanted to send a clear message to Sainsbury’s that they can’t keep profiting from the occupation of Palestinian land, so on Saturday November 1st our three teams headed for the big Sainsbury’s in Lewes Road, Brighton. 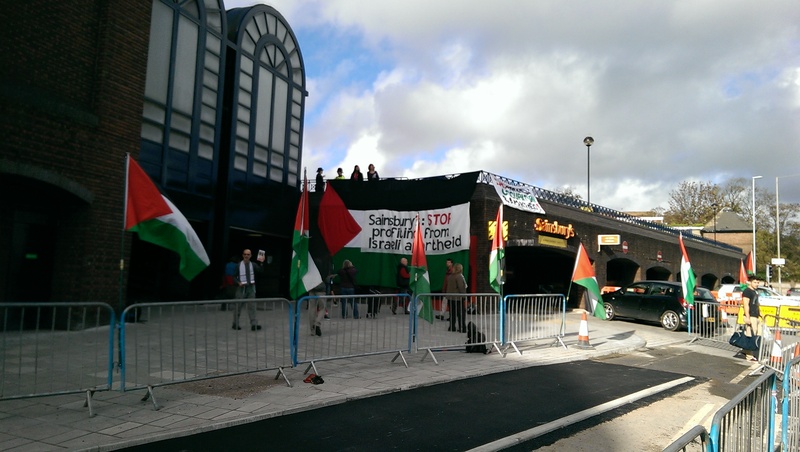 The action was a combined effort: BHPSC, together with other pro-Palestinian groups – including student activists from both local universities. Team 1 went into the store, filled trolleys with Israeli produce (of which there was a lot) and took it to customer services. 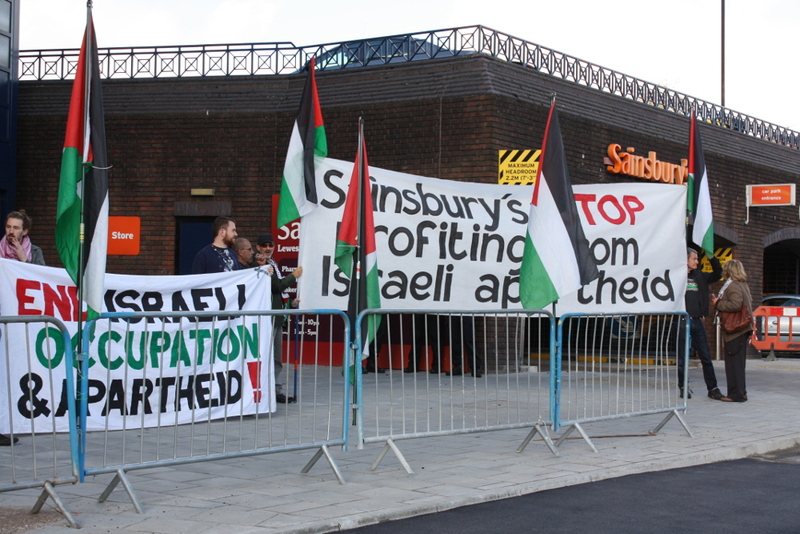 After quite a delay the Manager eventually came out and spoke to them, but was more interested in asking them to leave, than in discussing why Sainsbury’s is ignoring its own ethical trading policy. 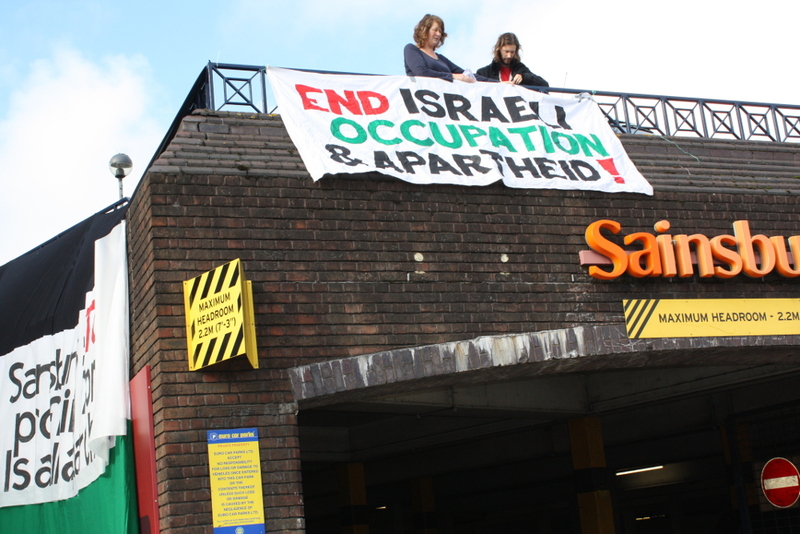 Team 2 headed for the roof top car park, and dropped a giant Palestinian flag with a clear message on it: “Sainsbury’s, STOP profiting from Israeli apartheid”. 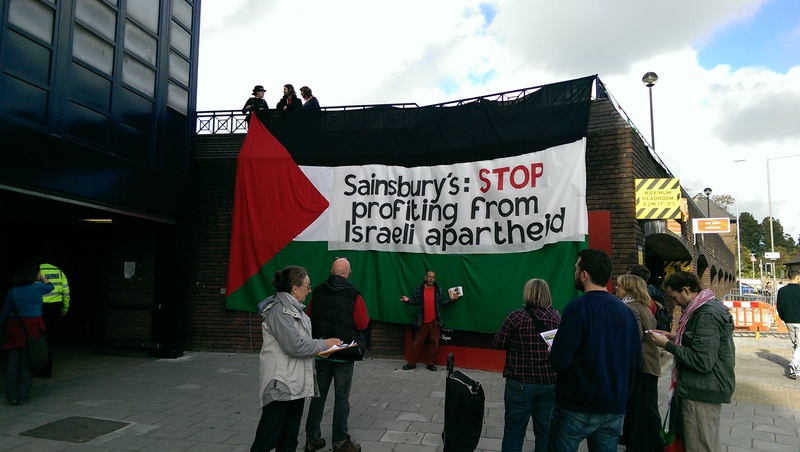 Team 3 leafleted shoppers, explaining why we are asking Sainsbury’s to stop trading with the companies that profit from the theft of Palestinian land. They also gave out postcards asking supporters to sign the Pledge to stop shopping in Sainburys until 31st December 2014. 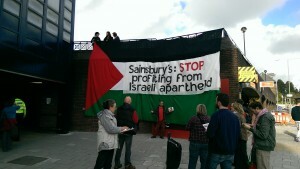 The public response was amazing. Passing cars tooted their support, and lots of people chose to go elsewhere to do their shopping, and to sign the pledge.